Getting a kayak specifically designed for fishing has many advantages. You have portability and ease of use that no one with a full size boat will ever have, and you can fish lakes that are designated canoe and kayak waters. Kayaks are much cheaper than boats, they’re quiet, and maintenance free. For under 1000 dollars, you can get a fishing kayak that’ll last your whole lifetime, giving you years of opportunity on the water. Here are three options for the best fishing kayak under 1000 dollars. It always helps to break things down when making a choice. Here is a simplified view of the contenders. Ocean Kayak's performance hull is fast, stable, and quiet, with a frame designed to handle calm or rough waters. The Prowler 13 Angler's large easy-to-open Click Seal front hatch offers easy access to bow-to-stern internal storage and accommodates multiple rods for safe storage below deck. Easily store coolers, crates, tackle boxes, bait wells, and SCUBA tanks in the rear oversized tank well. Includes two cup holders and two paddle keeps; measures 13 feet 4 inches and weighs 56 pounds; capacity of 325 pounds. Lifetime warranty on the hull. 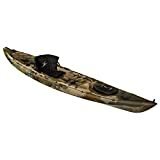 One of the best fishing kayaks on the market, the Prowler kayak combines stability with speed to help you get to your favorite fishing hole as fast as possible. It’s 13′ 4″ long, which helps the speed but also gives you more storage space. You can see it has storage areas in both the front and back of the kayak, with the front being covered with a hatch to make it waterproof. This kayak is made of durable polyethylene and weighs in at 56 pounds, which is light for a 13 footer. The weight limit on this is 450 pounds, so it can fit just about anyone. It has 52″ of leg room as well, so if you are tall, this kayak should fit you perfectly. It is also a sit-on-top style, so it’s easy to get out of and into. As far as angling goes, this kayak has two fishing rod holders built in just behind the seat on each side. It comes with a small scupper, or basically a slot, for a transducer for a fish finder. The graphics on it don’t stick out like a sore thumb to fish like a bright yellow kayak does, either. Carrying handles are mounted on the sides so you can carry it easily overhead. It does have paddle keepers on the side to hold your paddle while fishing. Lastly, it has a built-in cup holder for carrying your beverage of choice. Reviewers rave about the stability of this watercraft, and the fact that it will fit about anyone regardless of height or weight. It’s also set up to hold you and all your fishing gear, plus a cooler on the back if necessary. With this kayak, you could easily make overnight fishing trips across the water since it can hold so much gear and is so fast. For under 1000 bucks, this kayak is absolutely a steal to get you out on the water in style and comfort. If you are looking for a fishing kayak that’ll seat multiple people on a fishing trip, here it is. The Lifetime Sport Fisher claims it’ll hold up to three people, while two people are probably more realistic if you are trying to fish. If you and your spouse or fishing buddy like to go fishing together frequently, this kayak is the solution. Convince a buddy to split this with you to get out on the water for cheap! The weight capacity is 500 pounds, so if you do load three people on there, make sure your combined weight isn’t more than that. It is 10 feet long and also made out of polyethylene. It comes with paddle holders so you can set your paddles down while fishing, and it has three fishing rod holders. The hull design is a tunnel hull, or basically a pontoon type hull with an arch in the middle that provides ultimate stability. This kayak can also be equipped with an accessory mount that you can mount a trolling motor to if you would like. There are two cup holders, but as far as storage goes, there isn’t a whole lot of it on this kayak with it being only 10 feet and designed for multiple people as far as space for tackle bags or fishing gear. This makes it ideal for short day trips with a buddy out onto the lake. If you are looking for a kayak to fit you and a partner, this is your best option. It comes with a limited 5 year warranty against manufacturers defects. Another kayak from Lifetime, the Tamarack is a single person fishing kayak that is 10 feet long and very stable. It has a flat bottom to give you a solid fishing platform. It won’t be the fastest kayak available due to the flat bottom and shortness, but it will get you out fishing for a great price. The weight limit on the Tamarack is 275 pounds. It weighs 52 pounds and has a carrying handle on each side for easy transportation and loading by yourself. It’s a sit on top kayak, like most fishing kayaks, and has three fishing rod holders, including one swiveling one you could troll with. There is nowhere to stash your paddle while fishing, but you could separately purchase paddle holders to mount on it. This kayak does have some space for gear as well, but definitely not a ton. If you are looking to save a little more money, this kayak is a great option, though you won’t get the same performance as you would with the Ocean Kayak above. 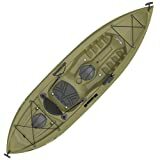 This is a solid fishing kayak designed to get fisherman out on the water at a great price. It comes with a limited 5 year warranty against manufacturers defects. Lastly, you could try to build your own wooden kayak. Though this may seem like a lot of work, many people simply love the feeling of paddling around in something they have crafted with their own hands and poured their sweat and tears into. There are some plans available online, mainly for sale, and you can start by clicking. if you are interested – may be another way to find the best fishing kayak under 1000 dollars for your needs. But, to be honest, save some time and buy one of these! If you’ve been dreaming of getting out on the water, a kayak is your best option to get started. 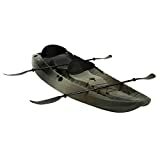 They are portable, maintenance free, and best of all, cheap, as shown here with the best fishing kayak under 1000 dollars. We hope these choices for best fishing kayak under 1000 dollars will help any angler with their next fishing trip.